As I type this, still only 69% of the votes are reported here (in California). I don't know who's going to win. We did a piece at THIRD on AP "Lying on the eve of the California primary" -- AP should be punished for what they did. Tuesday, June 7, 2016. 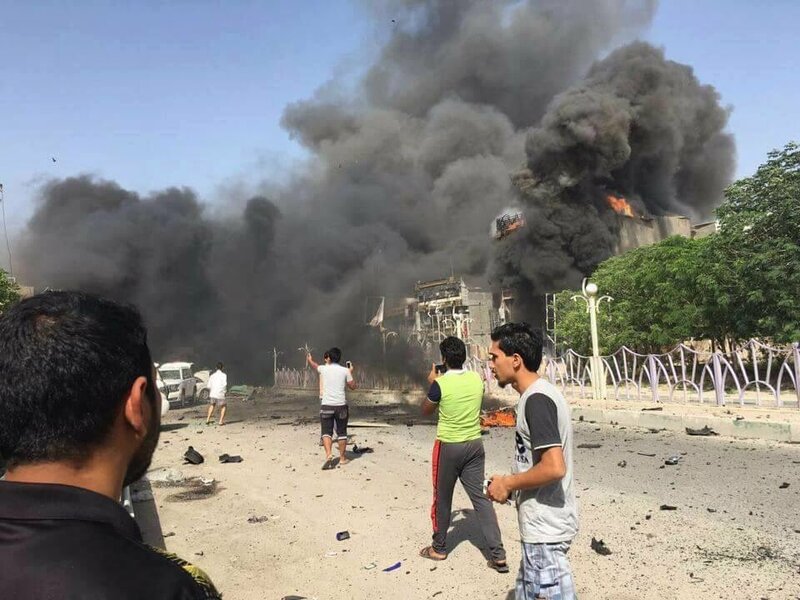 Chaos and violence continue, war crimes in the 'liberation' of Falluja get attention from the United Nations, war crimes in the 'liberation' of Falluja get spun by the US State Dept, Moqtada al-Sadr's followers stage a big rally in Baghdad, the western press ignores it, and much more. The big news in Iraq today was the protest in Baghdad. And you know it was huge because the western media refused to report on it. ALSUMARIA reports that the demonstrators called for an end to corruption and demanded a government of technocrats, one free of political parties. The huge crowd pictured in the photo ALSUMARIA published demonstrates that even Haider al-Abadi's efforts to cut off the roads and bridges to Baghdad could not stop today's huge turnout in Tahrir Square. Those rallying are said to be followers of Shi'ite cleric and movement leader Moqtada al-Sadr. On Arabic social media, there are reports of violence carried out by the police on the protesters today. MP Aqeel Abdul al-Hussein (of Moqtada's bloc) has declared that Haider al-Abadi (US-installed prime minister of Iraq) will face consequences for his inability to bring about change and that the previous prime minister (thug Nouri al-Maliki) wasted government funds. ALSUMARIA also notes that Nouri's insulted the protesters in a Tweet and Moqtada has responded by noting that Nouri was no agent of change and failed to make a squeak as Iraq's resources were plundered by corruption. Meanwhile AL MADA reports that Moqtada has accused Mohammed al-Ghabban of implementing a foreign agenda. al-Ghabban is the Minister of the Interior. al-Ghabban is a Shi'ite politician who is part of Nouri al-Maliki's State of Law coalition and who belongs to the political party for the Badr militia. IRAQ TIMES notes the statements and states they came following an arrest warrant being announced for Moqtada. Parliament is currently out of session and not due to return until July. An online poll at ALSUMARIA currently finds that only 24.8% expect Parliament to convene a session before their scheduled return. (75.2% vote there will be no emergency session.) This belief is in keeping with statements made by MPs. For example, Sunday NATIONAL IRAQI NEWS AGENCY quoted MP Diaa al-Asadi stating that the Ahrar bloc (Moqtada's bloc) would not end its boycott of Parliament until a vote took place on a cabinet. On what western media will report . . .
Maybe you caught AFP or IANS or other outlets this week reporting on the over 400 corpses in a mass grave in Saqlawiyah ("near Falluja") -- victims of the Islamic State. Doesn't appear to have happened. ALSUMARIA reports that the Iraqi military's media branch announced today that there was one corpse above ground and two buried and that the claims of 400 are inaccurate. ALL IRAQ NEWS quotes from the statement of the Joint Special Operations Command's media division that following on-site research it's clear that there are no mass graves." 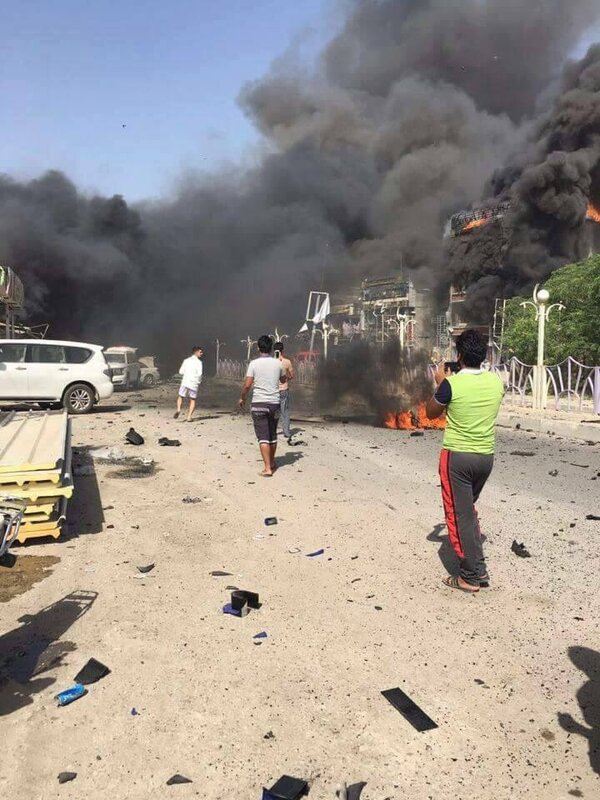 Turning to the liberation -- or 'liberation' -- of the Sunni city of Falluja, AP reports it has hit another speed bump due "to disagreements about battlefield strategy among the disparate Iraqi forces fighting the Islamic State group." Meanwhile the Shi'ite militias -- now part of the armed forces thanks to Haider -- continue to persecute Sunni civilians. GENEVA (7 June 2016) – UN High Commissioner for Human Rights Zeid Ra’ad Al Hussein on Tuesday urged the Iraqi Government to take immediate measures to ensure that all people fleeing the ISIL-occupied city of Fallujah are treated in strict accordance with international human rights and international humanitarian laws. “The Prime Minister, and other political, community and religious leaders have made very welcome statements, calling on all those involved in the military operations to do their utmost to protect civilians in all circumstances and to ensure accountability for any individuals perpetrating violations. I urge the Government to take immediate, concrete steps to ensure that these calls are translated into action,” Zeid said. Since January 2014, when Fallujah was captured by ISIL, at least 22,169 civilians have been killed and 43,435 wounded in Iraq. These casualty figures are considered an absolute minimum as they do not include Anbar Province, where Fallujah is located, and also do not include people who died from secondary effects of violence, such as lack of water, food, medicines or health care. When the issue was raised at today's US State Dept press briefing, spokesperson Mark C. Toner attempted to dance around the issue. QUESTION: -- since we’re still talking about trying to fight ISIL, among other things: Last week you talked about Fallujah. There are more reports about Shia militiamen detaining Sunni men who are trying to flee Fallujah, and there are more allegations that they’re being abused, that they’re being tortured. Dozens is one rough estimate. Even the UN high commissioner for refugees is saying – for human rights, excuse me – is expressing concern about the situation, and he is also expressing concern that the Abadi government isn’t doing enough to restrain the Shia militia from carrying out sectarian attacks. One, what is the U.S. assessment of the situation right now? What is the U.S. Government saying to Prime Minister Abadi? What is the U.S. prepared to do in order to basically keep the Shia militia away from Fallujah so that people who are trying to escape the fighting can do so safely? MR TONER: Sure. Lots of very good questions, and obviously, it’s a very difficult situation in and around Fallujah. The reports – and we’ve seen these reports as well – are obviously concerning. We do believe, though, that Prime Minister Abadi has made an effort to investigate abuses of Iraqi civilians at the hands of Iraqi Security Forces. I think he’s even pledged to form a committee or has created a human rights committee to look at some of these abuses. We believe the Government of Iraq has made an effort to avoid civilian casualties and to hold accountable those in isolated cases of misconduct. Now, there have been – and we talked – I talked about this last Friday – there have been efforts to screen citizens as they flee Fallujah. MR TONER: And I think – I’m looking at my thing – I think some 15,000 civilians have already fled the fighting in and around Fallujah and have arrived and are safely being held at camps, and there have been screening measures put in place, and we have talked about that. MR TONER: And partly that’s common sense that [. . .] ISIL isn’t using – trying to exfiltrate or get out of Fallujah, use it as an escape route. So – but let’s be very clear that any kind of screening, while justified, needs to be done in a manner that is respectful of human rights and common dignity, and also done in a transparent manner. QUESTION: -- about the fact that in the effort to liberate these communities from ISIL, that the U.S. would not want to see Shia militia going in because of the very fundamental symbolism that represents. Is it appropriate for the Iraqi Government to rely on these militia, the PMF, to do the screening? Should the Iraqi military be using some of its own forces to do this screening? And should the Shia militia even be allowed anywhere near Fallujah? Why can’t they be held to barracks, to use an expression? QUESTION: But then we hear about people being dragged away, bodies being turned up, some people so badly injured that they’re now in hospital trying to get medical treatment that may not be easily attainable given that these are conditions of war. Here’s an alternative suggestion: Perhaps the U.S. doesn’t want to have its own people screening people leaving Fallujah, but there are other members of the coalition. Is it possible to ask the Arab countries that are part of the coalition to do the screening of people as they’re trying to leave Fallujah? MR TONER: Well, again, those are all good points and good questions better directed to the Iraqi Government. I would say that thus far in Fallujah, fully recognizing that we have seen reports and we’ve raised those reports on our concerns about them with the Iraqi Government, but we have seen thus far an effort by Prime Minister Abadi and his leadership to manage the offensive carefully, deliberately, with respect to ordering safe passageways – and I talked about the 17,000 Fallujah residents who have gotten safe passage out of the city – and made an effort to respect both property and the well-being of the civilians. But again, as there are cases or allegations of these abuses – and you cited some of them – the Iraqi Government has pledged to create a committee to look at these allegations in cases, or rather incidents, and follow up on them. And I think that that is absolutely commendable and necessary. QUESTION: Do you have confidence in this committee that they’re standing up? MR TONER: I think, again, we’ll wait and see. But they have pledged to do so. Thus far, what we’ve seen largely from the Iraqi Government has given us confidence that they are aware of these tensions on the battlefield and are taking steps to mitigate them. QUESTION: Did you confirm the reports by the UN human rights commissioner today that he said he have credible reports about these violations? Are you confirming his position? MR TONER: I have not seen those. I do note that we’ve seen reports of violations and are concerned about them. I’m not speaking to his – I have no idea what he said. I’m sorry, I don’t – I haven’t seen his comments. QUESTION: He said they have – he have credible reports about very sad violations against civilians fleeing from Fallujah. MR TONER: I mean, again, we’re aware of some of these reports and we’re concerned about them as well. Toner hadn't seen the UN statement so he probably also missed photographs. Like these. ALSUMARIA reports KRG President Massoud Barzani has declared that a post-Islamic State plan for Mosul is needed as is guaranteeing the rights of those civilians in Mosul before any operation to liberate Mosul takes place. -- Near Beiji, three strikes struck two separate ISIL tactical units and destroyed three ISIL fighting positions and an ISIL mortar system. -- Near Fallujah, four strikes struck two separate ISIL tactical units and an ISIL vehicle bomb factory; destroyed three ISIL fighting positions, an ISIL weapons cache, three ISIL heavy machine guns and an ISIL front end loader; damaged an ISIL fighting position; and denied ISIL access to terrain. -- Near Habbaniyah, a strike struck an ISIL tactical unit and destroyed an ISIL fighting position. -- Near Kisik, a strike struck a large ISIL tactical unit and destroyed five ISIL weapons caches, two ISIL bed-down locations and an ISIL command and control node. 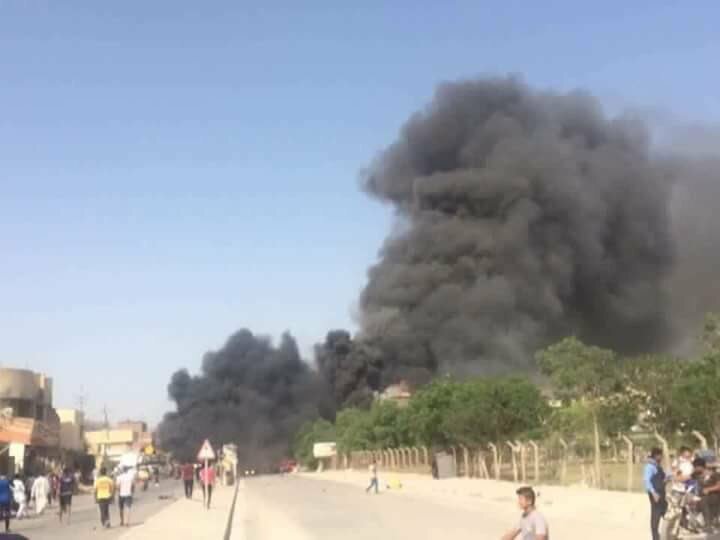 -- Near Mosul, three strikes struck an ISIL oil tanker storage area, an ISIL logistics facility and an ISIL vehicle bomb factory. -- Near Qayyarah, two strikes destroyed seven ISIL rocket rails. -- Near Rawah, a strike struck an ISIL tactical unit and destroyed an ISIL vehicle. -- Near Sinjar, a strike destroyed an ISIL vehicle. 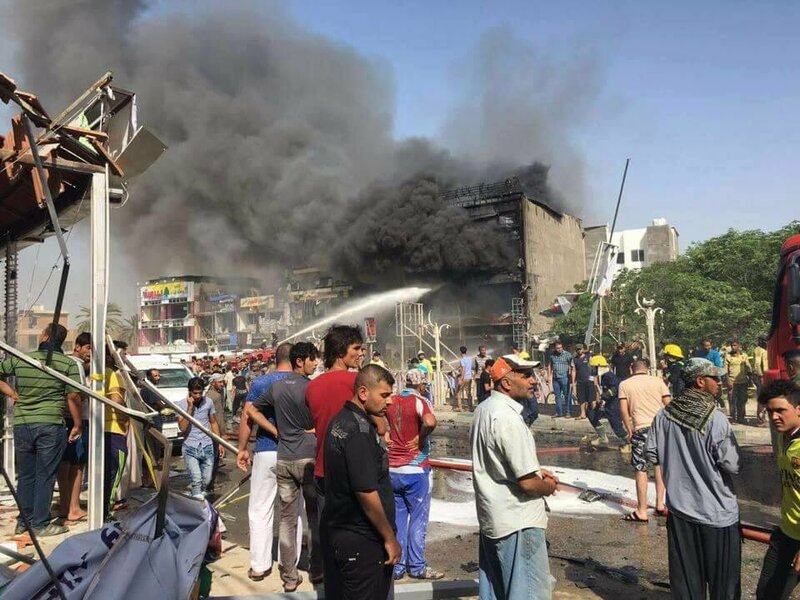 In other violence, AFP adds that a Karbala car bombing left 3 people dead and thirty-three more injured. Turning to US politics, we'll close with this Tweet. Don’t let anyone tell you that great things can’t happen in America. 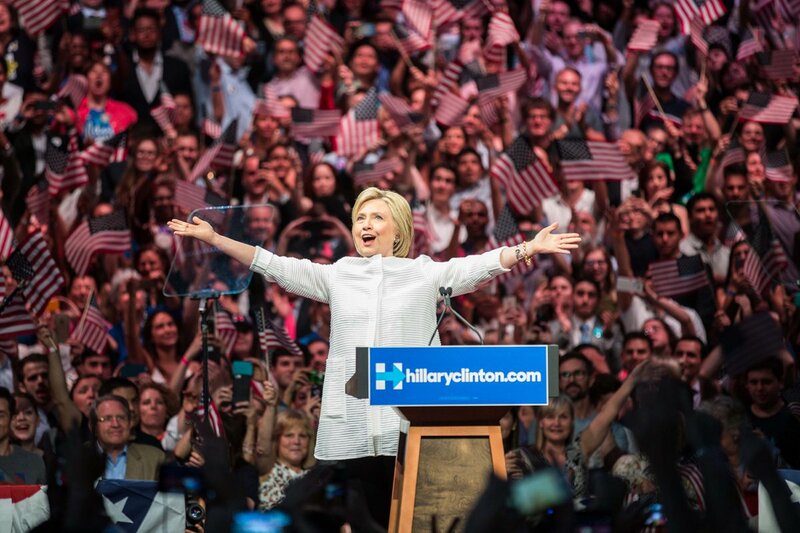 How crooked can she be?